Stevia leaf is native to South America and is commonly used there as a natural sweetener. However, the Food and Drug Administration has only recently approved powdered and liquid stevia leaf extract for use as a sugar alternative in the U.S. As of 2010, the FDA doesn't yet permit whole-leaf stevia or crude extracts to be used as additives in processed foods. However, stevia's advocates claim it has many health benefits. Using the highly refined extracts from the stevia leaf as a zero-calorie, 100 percent natural sweetener can help reduce your intake of sugar. Stevia is actually 300 times sweeter than regular sugar with a minimal aftertaste, yet it is suitable for sugar-sensitive people, such as diabetics. Stevia will not cause cavities and is heat-resistant enough for use in baking and cooking, according to the 2005 book, "Dr. Gillian McKeith's Living Food for Health. Refined, simple sugars are a leading cause of obesity in the U.S., according to KidsHealth, and substituting other noncaloric sweeteners for table sugar can promote weight loss and maintenance. 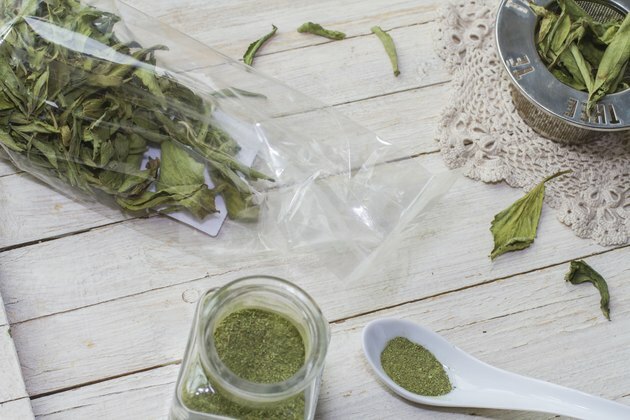 Naturopath Mark Stengler says in his book, "The Natural Physician's Healing Therapies," that stevia can help regulate blood-sugar levels and has long been used in South America as a hypoglycemic aid for diabetics. Stevia may also help in lowering high blood pressure but won't lower normal blood pressure levels. This plant may also curb sugar, tobacco and alcohol cravings. Stevia leaves contain various vitamins and minerals, like vitamin C and A, rutin, zinc, magnesium and iron, according to Dr. Sanjeev Gupta in the book "Kick Your Sugar Habit." The stevia leaf is also rich in antioxidants, which helps to safeguard the body from free-radical damage as a result of metabolic and environmental factors. A particular enzyme present in the leaf, called superoxide dismutast, may also help to inhibit cancer cell growth, although further research is needed. MayoClinic.com: Stevia - Can it Help with Weight Control?